Here, an Origin Pull CDN means your content is pulled off your website upon a request by the CDN servers. You don’t have to push or upload your content to the CDN provider. Read about the differences between Origin Pull CDNs and Pull CDNs on Push Vs. Pull: The Tale of Two CDNs. For small websites with not too much traffic, a CDN is pretty cheap nowadays. Only a few dollar cents per GB traffic a month. Suppose you own multiple websites with hosting packages and web space to spare. Why won’t you store content from one website on the other, to offload the content and improve the speed and performance of your website? Offloaded files are downloaded in parallel. This article is specifically for WordPress blogs and the WP-Super-Cache plugin is required! Besides utilizing WordPress and the WP-Super-Cache plugin, you can also use IIS Outbound rewrite rules. The code in this article is provided AS-IS, is not secured or production ready! But it does work. Use at your own risk. The .htaccess file checks whether files already exist on this remote side and rewrites requests for files that are not yet stored there. This is the actual Origin Pull CDN mechanism. Requests for files that not yet exist on the remote side are sent to this cacheme.php file. It automatically creates the directory structure recursively, if it’s not yet created. We use a cURL GET to verify the requested file exists on our local side, and store the file on the remote side if it does. To delete the remote content, you can use and/or modify a PHP script like this one: Recursive Directory Delete Function. Update 2018-08-01: the lixlpixel.org URL mentioned above no longer hosts the required PHP code function. It’s a SEDO parked domain now 🙁 Here’s an archive.org link: https://web.archive.org/web/20130415081206/http://lixlpixel.org/recursive_function/php/recursive_directory_delete/. 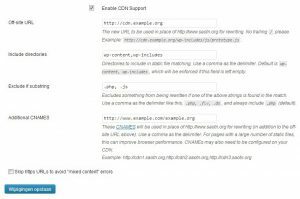 In this post I showed you how to create your own Origin Pull CDN (Content Delivery Network) with just a few lines of PHP code, to boost WordPress performance. I modified the scripts and created this post to show you what you can do to improve your website performance, but also all the fun things you can do with PHP (or any other language). If PHP and .htaccess are not in your comfort zone, you can set up an Content Delivery Network (CDN) using IIS Outbound Rules. You can even create a global DNS load balancing and Varnish Cache (CDN) service on relatively cheap DigitalOcean droplets. Hello minh kien, what is the error you get? The code might need some tweaking, depending on your set up of course, and unfortunately I cannot provide support for that. Thanks for your shares, this work fine for me..! Thx for the code, it helped a lot! There is a typo in your htaccess, you added a space just before the L. It will cause an error. Very nice find and post WiZZarD, using outbound rewrite rules for this purpose 🙂 Next time mod_proxy/mod_cache?